By Samantha McCabe · Sept. 26, 2016, 3:45 a.m.
A new rollout of coffee sleeves at Uppercase in the Nest at the beginning of the fall term attracted lots of attention from students, faculty and staff. 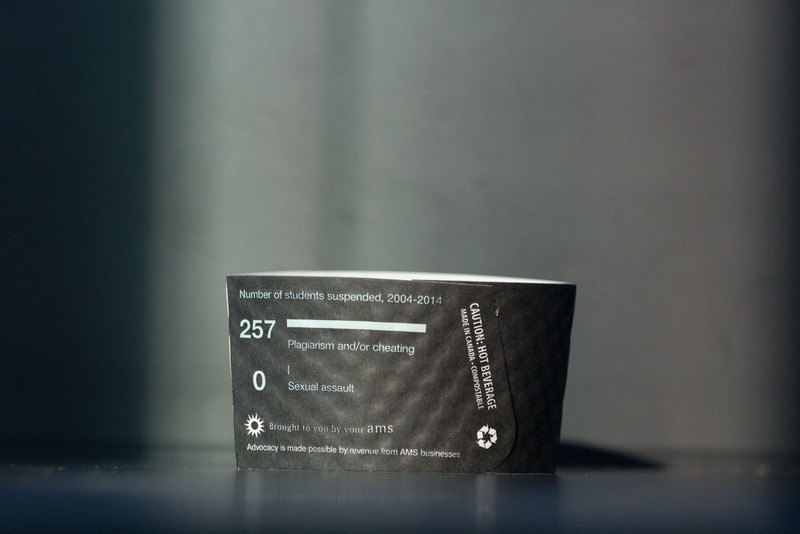 The attention-grabbing campaign from the AMS features the cardboard sleeves scribed with statistics of the number of students suspended from 2004 to 2014 for two different reasons — for “plagiarism and/or cheating,” 257 students, and for “sexual assault,” zero. “This is Our Campus,” the sleeves proclaim on the other side, along with a link to learn more about UBC’s stand-alone sexual assault policy draft. The draft was released in June 2016 for consultation from the public. While the sleeves and their intention received very positive feedback from the community, they are just one piece of a broader AMS project. The campaign’s aim is to get students thinking and involved in providing feedback to UBC regarding the policy, as well as push the AMS’s specific recommendations. In another product distribution more recently, the AMS put fliers out as another tenant of the This is Our Campus campaign. The fliers provide students with a quick overview of the purpose of the campaign — “[an] opportunity for students to give feedback, make our voices heard” — as well as four recommended changes that the AMS decided on after extensive consultation with the Sexual Assault Support Centre (SASC). The AMS is distributing the fliers all over campus, as well as in all upper-year residences after receiving permission from the university. The first recommendation seeks for the university to amend the policy so that a procedure unique from the non-academic misconduct process for reporting is in place, specifically tailored for sexual assault cases. “The draft policy refers students to the Student Code of Conduct rather than explaining the process for reporting and what expectations survivors are entitled to in that process,” the AMS website explains of their second recommendation. “We want people who are potentially looking to report or [seeking] other options to be able to go to that policy as kind of a one-stop place where they can learn all of the information that they need to,” said Simpson. While third-party reporting is briefly mentioned in the existing policy draft, the AMS's third recommendation notes that it is unclear how exactly the procedure is going to work and therefore asks for clarity or explanations on it. As for the fourth recommendation, the policy features a short list of staff as resources who will receive UBC's sexual assault training. The AMS would like to see an expanded version. After the recommendations, a final section of the flier lets students check off whether they agree or do not agree with each of the four points separately, and then several blank lines invite students to make their own notes or suggestions for the policy draft. According to Simpson, the comments that the AMS receives from students on these fliers will be implemented into the report that they will be submitting to UBC at the end of September. The report is intended to reiterate the AMS suggestions — if the community agrees with them — as well as incorporate the consultation results in a formal format to the university for consideration. The final piece of the campaign is the large vertical banner hanging on a wall of the Nest's main floor, available for students to sign in support of the AMS recommendations. The banner highlights only the first recommendation, a choice that reflects the AMS's opinion that the first is “the biggest change that we need to happen,” according to Simpson. According to So, the success of this campaign and the accuracy of the subsequent report hinges on student engagement. “I’ve actually been super gratified with the response so far. I’ve never worked on a campaign that’s gotten so much positive attention, and I’m especially thankful for people that reach out and say that it is something that they care about as well,” said Simpson. 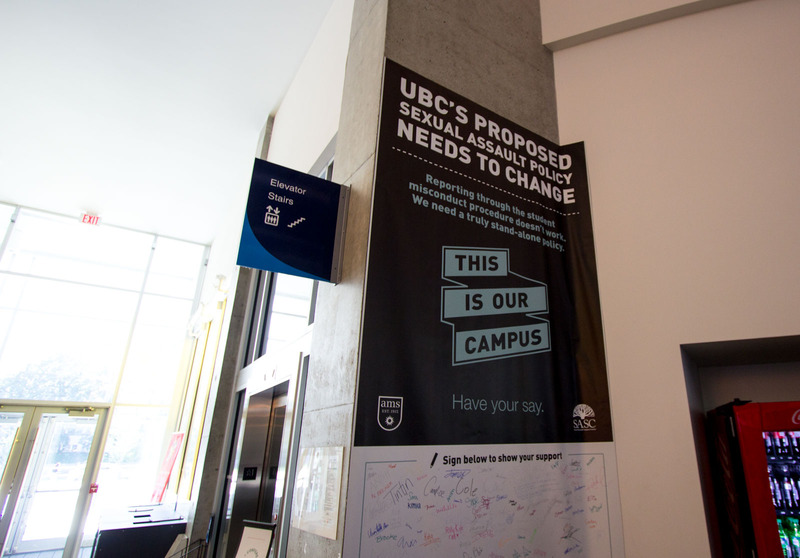 Previously, UBC has stressed how valuable they find the consultation from the community. Since it was extended, the consultation period will end October 31. Due to provincial regulation, UBC needs to have a completed stand-alone sexual assault policy in place by spring 2017.